The conference venue at The University of Oslo, Department of Informatics, is adjacent to the Forskningsparken subway and tram stops. Subway (T-bane) lines 3, 4 and 6 serve Forskningsparken station. The subway runs every 15 minutes on all lines during the week and every 30 minutes on Saturday and Sunday. Trains run from the early morning until just after midnight. Tram lines 17 and 18 also stop at Forskningsparken. Public parking is available at the Oslo Science Park (Forskningsparken), just southwest of Ole-Johan Dahl's building. However, due to the excellent public transport system in Oslo (and the fact that the Metro and Tram stops are closer than the parking), we strongly encourage people to arrive via public transportation. Ruter is the public transport system in Oslo and the surrounding county. City buses, regional buses, trams, subway/metro, ferries and local trains are included in Ruter's ticket system. Oslo Airport Gardermoen (OSL) is an international airport with direct connections to Europe, North America, the Middle East, and Asia. 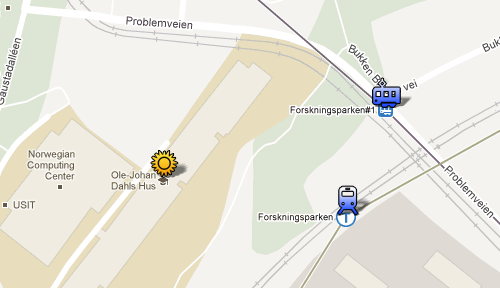 The airport has excellent public transport to downtown Oslo by train, bus, or taxi. Trains include the Airport Express Train (Flytoget), and the Norwegian State Railways (NSB). Sandefjord Airport Torp (TRF) offers direct connections to Amsterdam, Copenhagen, multiple cities in the United Kingdom and Poland, and throughout Europe, and indirect connections all over the world. Sandefjord is served by several carriers, including KLM and Ryanair. Sandefjord Airport Torp is located in Vestfold County, about 110 kilometer south of Oslo. You can easily get here by car, bus or train. If you arrive by train, a shuttle bus will transport you to the terminal building (approx 4 minutes). Moss Airport Rygge (RYG) offers direct connections to Denmark, Germany, Belgium, England, Ireland, Poland, France, Italy, Spain, Greece, and nine other countries in Europe. Rygge is served by Ryanair, Norwegian, and DAT. NSBs regional train has frequent trips between Rygge and Oslo Central Station. Rygge Station is located just 4 kilometers from the terminal. There are complimentary buses to and from the airport. A bus is also available from Rygge to downtown Oslo. You can also reach Oslo by ferry from Kiel, Germany, and Frederikshavn and Copenhagen, Denmark.